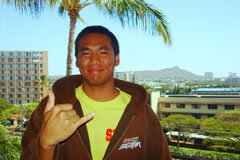 Jeff Fines, of ‘Aiea, is the eldest of three siblings. Just finishing up his junior year, he is inch by inch reaching his goal of earning a B.S. degree in Electrical Engineering at the University of Hawai‘i at M?noa. Jeff enjoys all types of outdoor activities; as an avid stargazer, he is especially excited to have to the opportunity to intern at the W.M. Keck Observatory on Hawai‘i Island this summer. As children we were all told that stars magically twinkled at night. Today we now know that the twinkling is caused by optical turbulence in the Earth’s atmosphere, also called “seeing”. This turbulence arises from the simultaneous presence of temperature gradients within the atmosphere and the stirring of the atmosphere. In addition, there is turbulence within and around the telescope that further degrades the seeing. Ultimately, we would like to achieve a means of measuring this turbulence within the dome, which could allow us to understand and improve the dome-seeing. A device called a Displaced-Beam Small Aperture Scintillometer (DBSAS) is potentially useful in measuring the turbulence present within telescope domes. The primary goal of this project is to develop a practical means of deploying the DBSAS within a dome, and to understand its performance and operational limitations. An initial deployment in the Keck II dome was useful in understanding these limitations and allowed us to carry out experiments. The DBSAS was deployed in a three-path fashion using a transmitter to propagate a laser beam, which was then reflected off a flat mirror, then reflected off a collimating mirror, and finally sent to a receiver which measures how much the laser beam has been distorted due to the turbulence along the propagation path. This configuration increases the sensitivity of the DBSAS by creating a longer path length within the relatively tight confines of the dome. The DBSAS primarily measures a turbulence property called the structure constant, CN2, which is directly related to the dome-seeing. Although experiments are continuing, presently the DBSAS, operating over a 62-meter path length at the summit, has measured a structure constant as small as 6.53×10-16 m-2/3, which is fairly close to the instrument’s rated sensitivity of 10-16 m-2/3 over a 100-meter path length. Additional experiments will be conducted for further results.